Xbox One customers in the United States and Canada can access over-the-air (OTA) TV using a third-party tuner and antenna, which will work in conjunction with your console's OneGuide. Below are the options and instructions for using an over-the-air tuner. Over-the-air tuners allow users to watch live, over-the-air digital TV channels (such as NBC, ABC, and CBS). The signal is captured by an antenna, transmitted via coax cable (RG6), and then received by an over-the-air tuner, which converts the signal to USB output. Availability and performance of over-the-air content can vary based on your location. For example, you may not be able to use an over-the-air tuner if you live in remote areas like a desert region or a valley surrounded by mountains. See the following section to learn how to find out if there is over-the-air coverage in your area. Xbox has partnered with the following over-the-air component suppliers offering tuners and antennas that are compatible with Xbox One. Note Other antennas may work with Xbox, but they haven't been verified as compatible. You'll need both an antenna and a tuner for over-the-air TV to work. Antenna: You can use a variety of over-the-air antennas to receive channels. Mohu offers several antenna options, based on the coverage in your area. Visit the Mohu Xbox page and enter your address to see which over-the-air channels may be available to you, along with recommended antennas. Keep in mind that if you live in a remote area, your options and performance will vary. 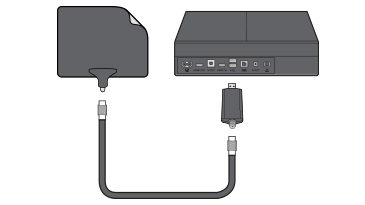 Tuner: The Hauppauge Digital TV Tuner for Xbox One is the only TV tuner compatible with Xbox One. Step 1: Place your antenna in a location that can best receive signals, such as a window. You may need to adjust the antenna for optimal performance later, so it's best not to permanently mount it just yet. Select OneGuide, and then follow the steps to complete TV setup. Step 4: Review the channels you received and adjust your antenna if the channels you expected to receive don't appear, keeping in mind that you may need to find an alternate location for the antenna. Once you've adjusted the antenna, you'll need to re-scan for channels. If you can't get a satisfactory signal, see the troubleshooting steps below. Most TV signal problems are due to either a bad signal coming into the tuner, or an incorrect setup. If your Xbox One console isn't displaying your TV signal, try the following steps. If your TV has a built-in over-the-air tuner, test the signal directly on your TV by unplugging from the tuner and plugging directly into the TV. Make sure you're in an area that has over-the-air signals. Look up your local coverage on this site: www.gomohu.com/xbox. Note that availability and performance can vary within a zip code for several reasons. Check other resources online for more information. If you appear to have coverage, try adjusting your antenna. Test other directions and directly outside via a window or door to ensure you have coverage. Use the troubleshooting help built into your TV's setup app. Make sure the over-the-air tuner is securely connected to both the coax cable and your console. Try a different USB port on your console. Select Troubleshooting and then select your issue. Check out the Troubleshoot section of Live TV support. If these steps didn't solve the problem, your tuner may need to be replaced. To order a new tuner, go to Device service and repair. Ensure the antenna has the best line of sight to the outdoors, such as in a window. Try pointing the antenna in a different direction. For example, if you're pointing east, point north. Consult the manual and/or manufacturer of your antenna for specific instructions. You may be in an area where over-the-air signals are poor. Unfortunately, this means you won't be able to use this system until those signals improve. Select TV tuner > Set up TV tuner, and then follow the steps shown. After the scan is complete, you'll have access to the channels you received. Would you like to contact Support regarding the "Over-the-air TV on Xbox One" issue you were reading about or a different issue?